_Release 4.1 barely renames memory mapped registers and bring no functional changes to version 4.0. Therefore the following description that was written for v4.0 originally, still applies. Enables high-frequency operation and support for burst mode in hardware v4 boards. Backward-compatible with v3 boards and earlier, while bringing in some additional features. PCB version recognition available at the FPGA as 6 bits (4 bits for the version number and 2 bits for the revision) and for diagnostics via the status register SR. For older boards (v3 and below), SR register will indicate 0, as there are no resistors to indicate the PCB version. Temperature is available in single register as 16-bit value. Temperature = 0d(TEMPR)/16. One-wire chip unique 64-bit ID stored in two 32-bit registers, readable from registers UIDLR and UIDHR. Separate pulse counters for TTL and for BLOCKING inputs, therefore two pulse counters per channel, CHxTTLPCR and CHxBLOPCR. Error data moved from SR (status register) to own ERR register. Pulse width selection switch, assigned to dip switch SW1.1. LONG: Pulses are 1.2us long. SHORT: Pulses are 250ns long. 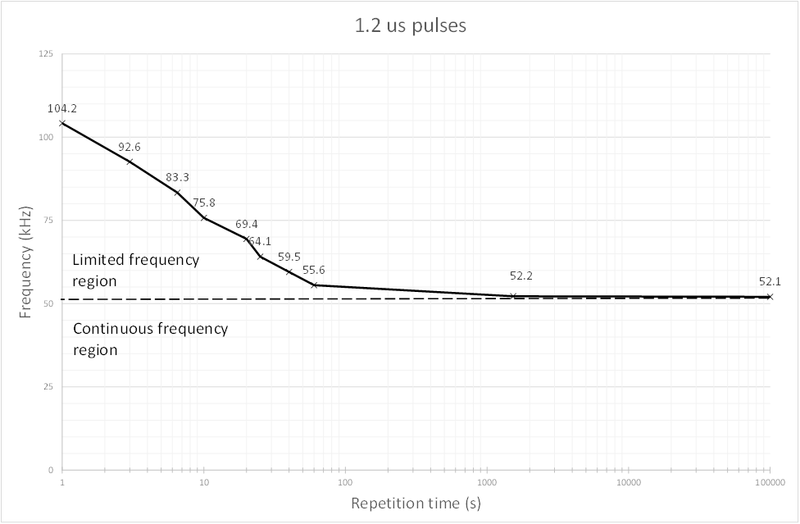 LONG pulses: maximum continuous repetition frequency 52kHz corresponds to 1/16 duty cycle (19.2us period). 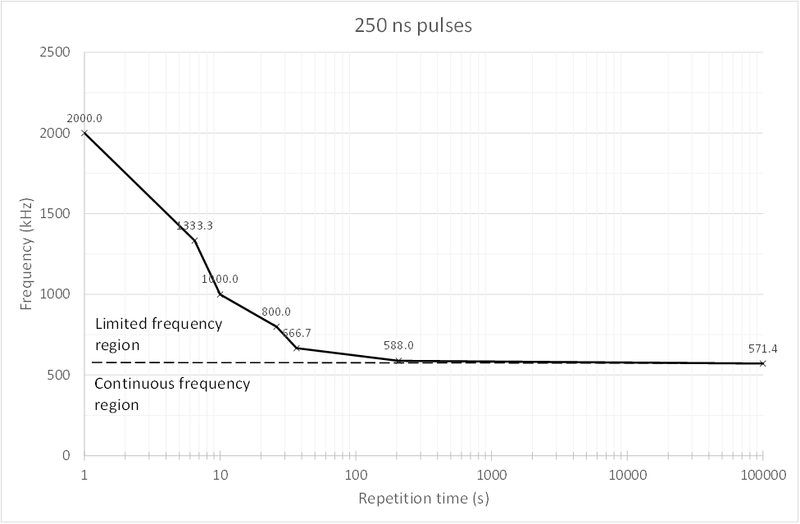 SHORT pulses: maximum continuous repetition frequency 571kHz corresponds to 1/7 duty cycle (1.75us period). High frequency Burst repetition: Higher frequencies can be accepted, but for a limited amount of time. LONG pulses: maximum burst frequency 104kHz corresponds to 1/8 duty cycle (8.6us period). Sustained for 1s maximum. SHORT pulses: maximum burst frequency 2MHZ corresponds to 1/2 duty cycle (0.5us period). Sustained for 1s maximum. The constants used to calibrate the burst mode, and define the frequency cutoff times as shown in the graphs above, can be generated using a spreadsheet attached to this project.